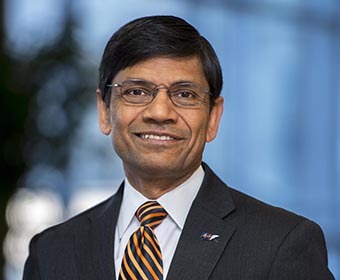 Mauli Agrawal, UTSA Interim Provost and Vice President for Academic Affairs, has served in several leadership positions in his 15 years at UTSA. (Feb. 6, 2018) -- The University of Missouri System today announced the selection of C. Mauli Agrawal, UTSA Interim Provost and Vice President for Academic Affairs, as Chancellor of the University of Missouri-Kansas City, effective June 20, 2018. Agrawal joined UTSA in 2003 as a professor and associate dean for research in the College of Engineering, advancing to dean in 2006. In May 2013, he was named interim vice president for research, a position he held until being named vice president the following year. In 2016, he was appointed interim provost. Agrawal currently serves on the board of trustees of the Southwest Research Institute, and is a member of Biomed SA, the Texas Research Park Foundation and the San Antonio Medical Foundation. He worked closely with the City of San Antonio and Mayor Julian Castro to establish the Texas Sustainable Energy Research Institute at UTSA, which received a $50 million pledge of support from CPS Energy. Agrawal’s research specialties include orthopedic and cardiovascular biomaterials/implants, and he has authored more than 300 scientific publications and 29 patents. His UTSA bioengineering research group has been responsible for starting three companies in San Antonio. Agrawal is a Fellow of Biomaterials Science and Engineering, the National Academy of Inventors, the American Association for the Advancement of Science, and the American Institute for Medical and Biological Engineering. Additionally, Agrawal served as president of the Society for Biomaterials in 2006. He has served on the editorial boards of various scientific journals, including the Journal of Biomedical Materials Research, Tissue Engineering, the Journal of System of Systems, and the Journal of Tissue Engineering and Regenerative Medicine. Prior to joining UTSA, Agrawal was a professor of orthopedics and bioengineering at The University of Texas Health Science Center in San Antonio, now UT Health San Antonio. He obtained a doctorate from Duke University in 1989, a master’s degree from Clemson University in 1985 and a bachelor’s degree of technology from IIT-Kanpur, India.